Oh how I love the scent of a fake Christmas tree! Many years ago Becky and I bought our first Christmas tree. It was a good quality artificial tree which we have used up until last year. In the box, which we dragged home on public transit, was a natural pine oil scent kit and about a dozen real pinecones to put the oil on. In our excitement (….and lack of any experience with scented oils) we used the entire bottle of oil. It was a tiny bottle! You can probably guess what happened next. Overwhelmed by the smell of pine, with tears actually in our eyes, we realized that the tiny bottle was probably a 10 year supply! We quickly collected the pinecones and put them in the trash. Not before they probably dripped all over the tree in the process. It was a ‘fresh’ December day so we opened all the windows and put our jackets on to air out the room. It eventually became bearable again. At least our eyes didn’t sting too much anymore. So that is the history of our existing tree. Every year for probably the past 10 years we have discussed buying a real tree, but in the end decide to stick with our fake. Until this year. Finally we got a real one! Once we brought it inside I felt like it should be decorated very simply. 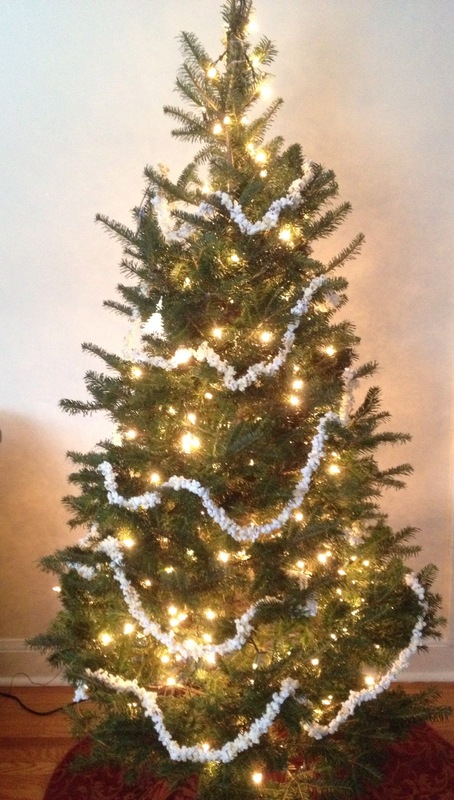 Some white lights and Becky and I were inspired to string some popcorn for a garland. That’s it so far. Not sure if we should add any more to it. So what do you have? Artificial or a real tree?